Most travel diaries fizzle. By day six of a big trip, people are struggling to recall what happened on days three, four, and five. They return home with mostly-empty journals, or bland writing that fails to capture the spirit of their journeys. Bring destinations to life with bold details. Splash those details quickly onto your pages so journaling doesn’t gobble up precious vacation time. Elude your “Inner Censor” and write with confidence. Weave together your “outer” and “inner” journeys, using unfamiliar places as backdrops for self-discovery. Dave shares his favorite journaling techniques, shows how to find time to write in the middle of an exciting trip, and infuses it all with a generous dose of his off-the-wall humor. Read “Globejotting” and become a travel journaling superhero! Read chapter one in its entirety and free excerpts from the other chapters. Check out all of Dave’s travel and humor books. Order autographed paperbacks or download for Kindle. 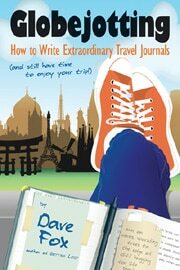 Dave now offers his popular travel and humor writing classes online! Until Dave’s humor columns move to this site, read them at davethefox.com. He writes books, guides tours, and offers lively presentations. Send feedback, ask questions, and subscribe to Dave’s e-mail list.